Dual purpose: can be plugged in or used with a 12v battery. This unit offers unique power settings with different pulse rates to help conserve battery power and make the fences safer for unknowing visitors. A 110v AC or 12v DC electric fence energizer used to keep out deer, raccoons and rabbits from garden/orchard areas. It is also used to keep in poultry, cattle, sheep, goats, horses, swine and guard dogs. Effective at protecting against coyotes, stray dogs, bear and fox. 1.74 joules in moist soils. .39 joules in dry soils. Requires 6' of ground rod (To order, see accessories tab above.) in the ground. Comes with a 110v plug-in adapter with a 6' cord and a 12v battery adapter. Has 4 pulse settings to adapt to various situations. Fast-day and slow at night. Use when pressure is higher during the day than at night (diurnal livestock). Fast- night and slow during the day. Use for nocturnal livestock and predators or when visitors are more likely to be around. Draw from a 12v battery is 180 milliampere(mA) per hour when set on the 'fast pulse' setting and 104 when set to the 'slow pulse' setting. With this energizer a 12v 100 ampere hour, deep cycle battery will last 14* days when set on the fast setting and 24* days when set on the low setting. *Assumes being drawn down to 40% between charges. Uses 20, 30 or 40 watt solar panel. Draws 1.5 watt per hour when set on the fast pulse. 8 of the 164' poultry nets. Versatile, can be used as a plug-in energizer or as a battery energizer. Adapts from one style to the other in a few seconds. Quickly mounts to a wall or fence post. The decision is yours as to pulse rate and battery consumption based on your needs. Mount the energizer at desired location. If using as a plug-in unit, it must be inside, away from risk of fire. Connect the Fence earth terminal (green) to the ground rod(s). Connect the fence output terminal (red) to the fence. Connect the energizer to the mains/battery with correct adaptor. Turn energizer on to desired pulse setting. Check the voltage on the fence with a fence tester. When working on the fence, make sure the energizer is turned off before working on the fence or the energizer. 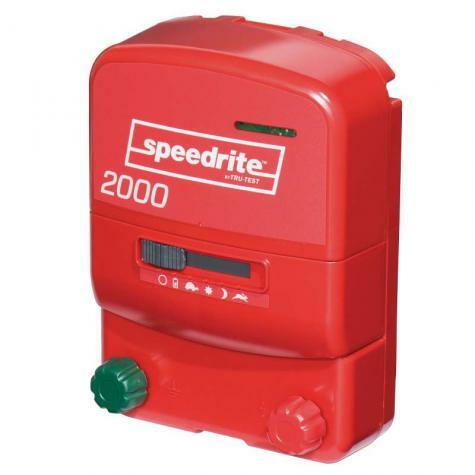 Replacement 110v adaptor for Speedrite brand electric fence energizers, chargers and fencers. This is a great fence charger. I use it with two of the 164' poultry nets and have no problems. Chickens stay in, the predators and cows stay out.